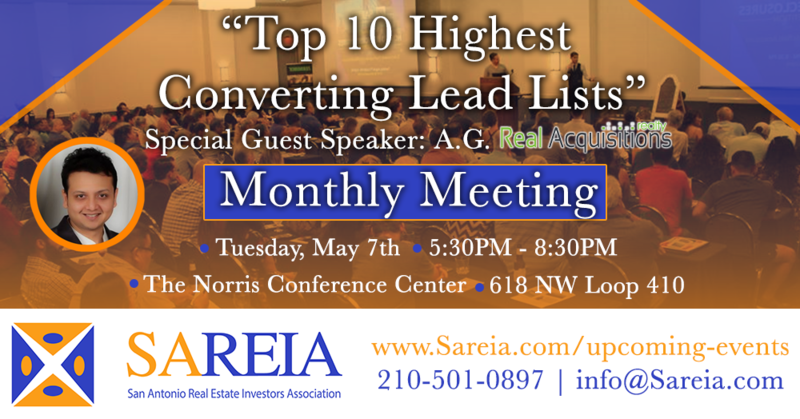 Real Estate attorney, investor, broker and president of SAREIA, Victor Maas & A.G. will be discussing lead generation. As many of you know, Victor has been investing in Real Estate for over 14 years. In addition, Victor has closed 100's of transactions ranging from Sub-2 deeds to full-blown rehabs. Victor prides himself on being a problem solver and gets creative on even the seemingly impossible deals. We are excited to invite "A.G." who is the CEO of RealAquisitions.Com. A.G. is renowned for his expertise in structuring un-conventional and creative Real Estate transactions. His talks specialize in adapting to the changing work of real estate investments and attract many new as well as seasoned investors. A.G also manages a luxury home construction business and a very active portfolio of residential and commercial real estate investments. RealAquisitions has a cutting-edge Pre-Motivated Distressed Property Lead Algorithm™ scours 15+ live-updated sources to laser-target sellers as they become increasingly motivated… before they appear on lists your competitors are pulling from! They even show you the most distressed sellers so you know the best place to start.